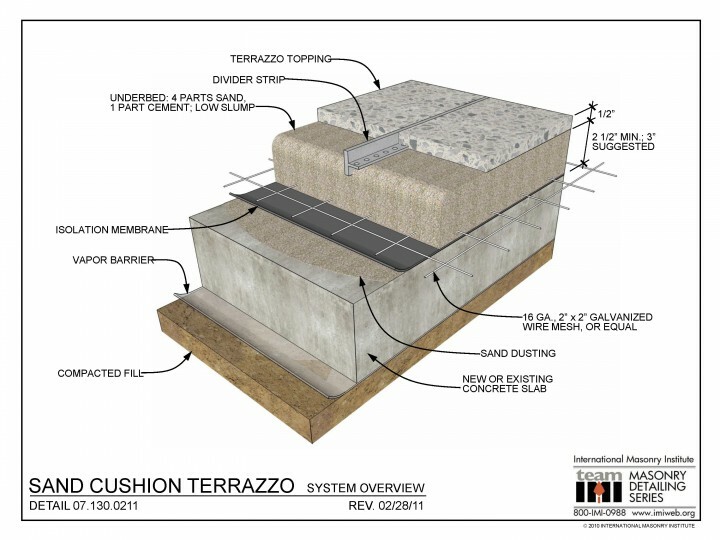 This detail shows a basic overview of a sand cushion terrazzo system. There is a vapor barrier underneath the concrete slab. Isolation membrane separates the cementitious terrazzo from the structural slab. A sand and cement underbed is built up 2 1/2″ to 3″ thick and reinforced with 2″ x 2″ wire mesh, and topped with divider strips and 1/2″ cement matrix topping The divider strips may be zinc, brass, or other materials. The aggregate may be marble or other material appropriate in size for the system and thickness. The system is ground, finished, and sealed per design.